People are always asking me what my favourite restaurants are. Okay, I do visit a fair few but strangely enough when I’m asked the question my mind usually goes completely blank. I do think that’s partly because it depends on so many variables…the weather, your mood, the type of food you feel like and your own personal taste of course, something that even the best restaurant can’t deal with if you simply don’t like that type of food. But a recent visit to a Cape Town restaurant helped me to think more clearly on the matter. The Food Barn in the sleepy town of Noordhoek is definitely on that list. And actually I don’t think any of the above criteria particularly matter in this case. Chef Franck Dangereux has created the perfect formula. The restaurant is situated in an old barn which gives it a charming, relaxed feel and you’re guaranteed a good helping of fine dining, too – without all that formality that often comes along with it. On our visit today the menu had changed significantly. Now that was a bit of a shock…there are old favourites (that word again) that people order religiously on every visit. To the extent that our friend, Candy, on seeing the new menu, asked the waitress if she could check if maybe there was the chance of her having his legendary prawn starter even though it was no longer on the menu. The chef was asked the question. His answer? No, it’s time to try something different. So we did! I’d already seen the new rock lobster starter being advertised and had firmly made my mind up that this was for me. It came warm on a bed of glass noodles and mushrooms with a light and beautifully tasty Asian-style sauce. 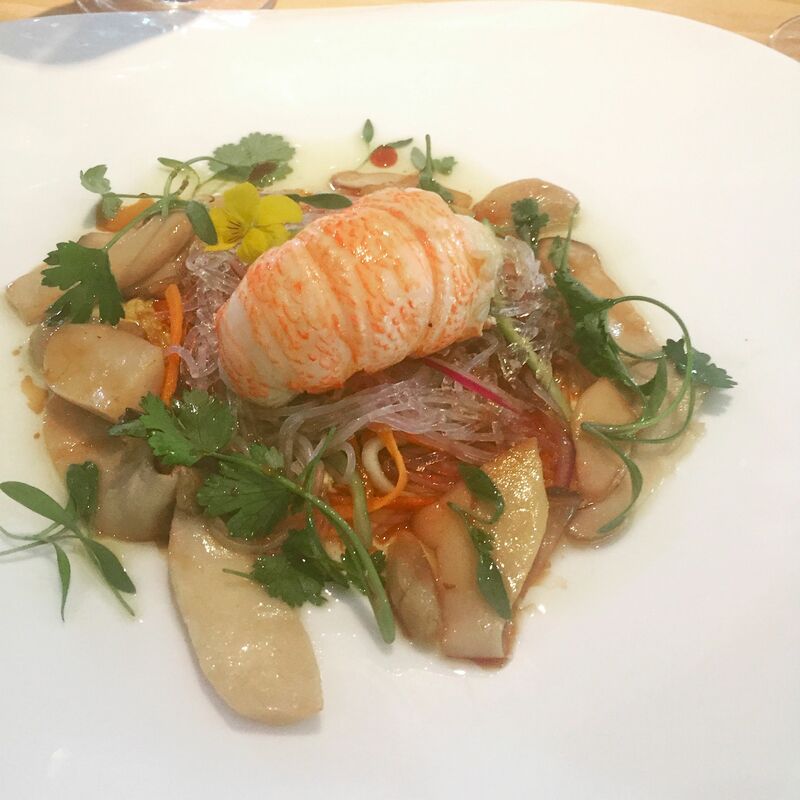 Plump, juicy lobster and wonderful clean flavours. Okay, that one’s a winner. Another starter choice, the strikingly green ravioli dish. 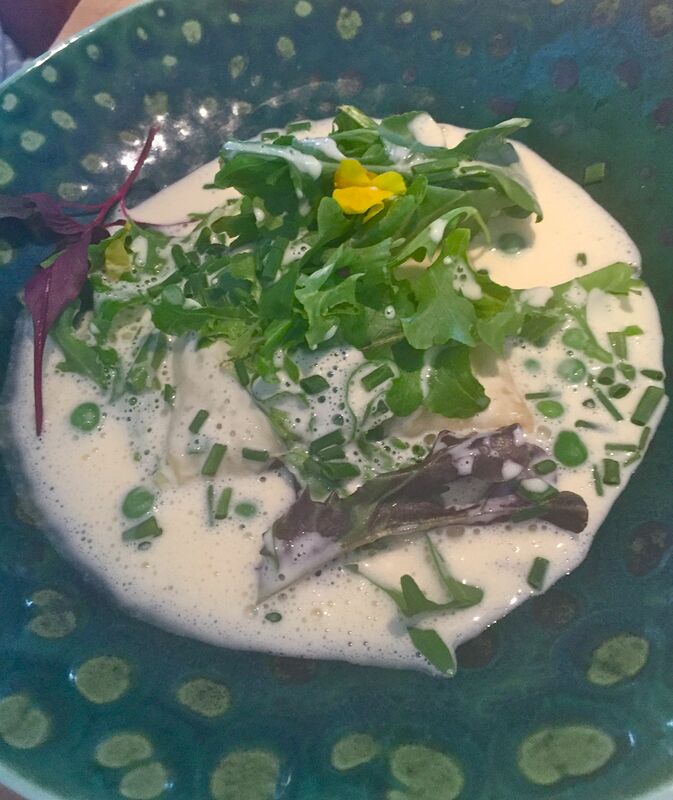 A large parcel (now there’s an usual take on ravioli) packed with a beautiful combination of peas and tarragon served with emmental and truffle cream and tender leaf shoots. The tastes of summer on a plate with a wonderful truffle undertone. Summery comfort food at its best, the home-smoked salmon came with steamed courgette ribbons, gratinated with artichoke and white truffle cream. 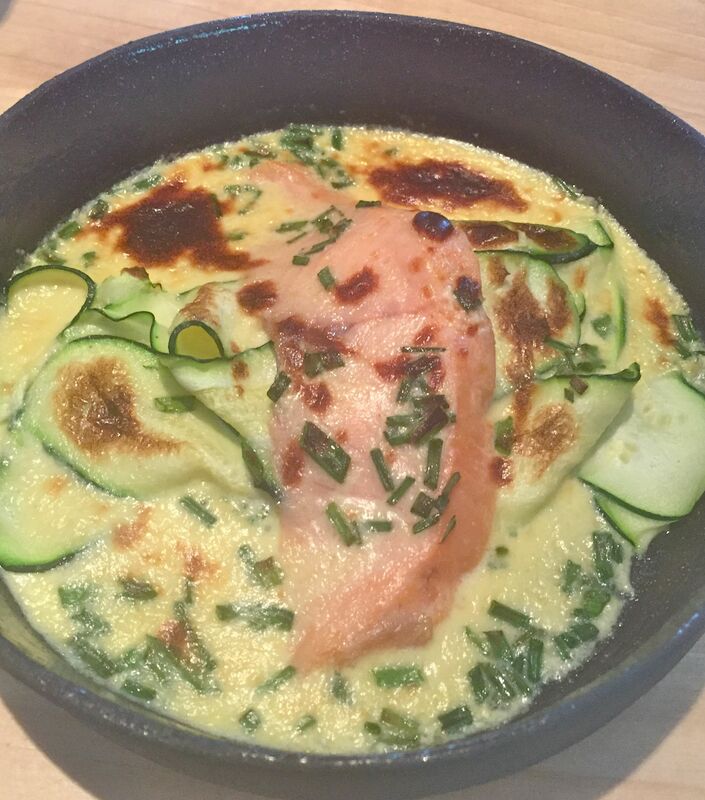 A picture in pink and green with the soft smokiness of the salmon perfectly complimenting the slightly crunchy courgettes and the lovely gratin flavours. All Franck’s dishes take inspiration from flavours all over the world. Another reason why everyone’s taste is catered for at this establishment. 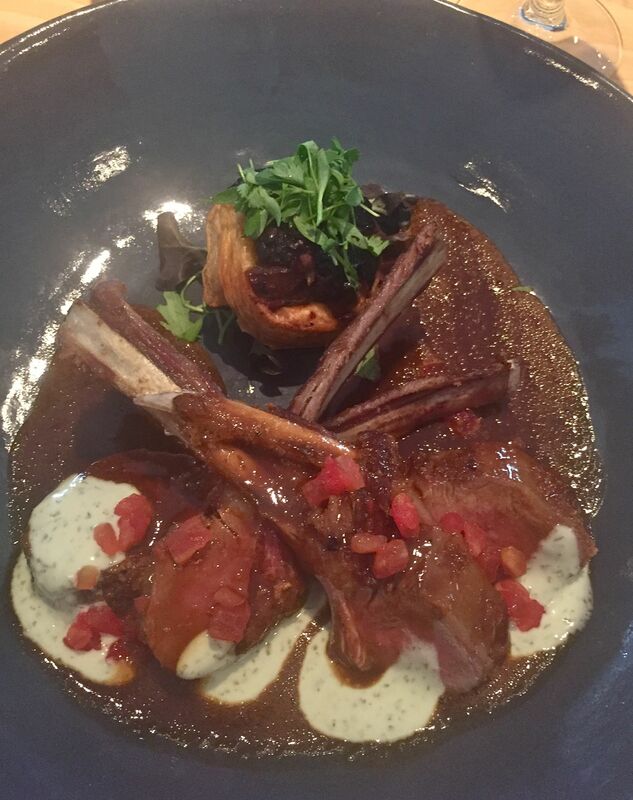 The lamb rack had a decidedly Moroccan touch – roasted with crumbs and spiced honeyed apple and served with a nut and turmeric tatin, cumin and mild chilli jus and coriander yogurt. 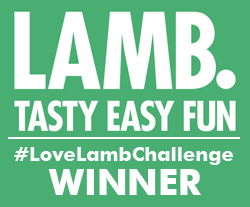 The lamb was oh-so flavoursome and tender and all the other components with their exotic flavours and different textures made for a wonderful dish. I could have done with less jus – clearly I need to start asking for the sauce on the side. Fussy or what? The fish of the day was cooked more in a European style (with a definite Frenchness about it) with a saffron and garlic potato mousseline, petite fennel salad and a creamed fond de roche sauce. 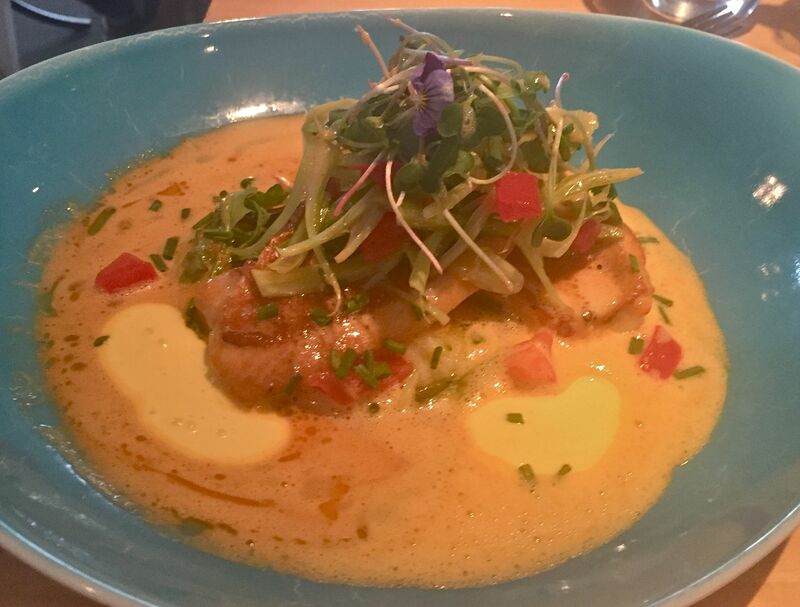 The earthy aromas of saffron welcomed the dish to the table in all its vibrant colours. 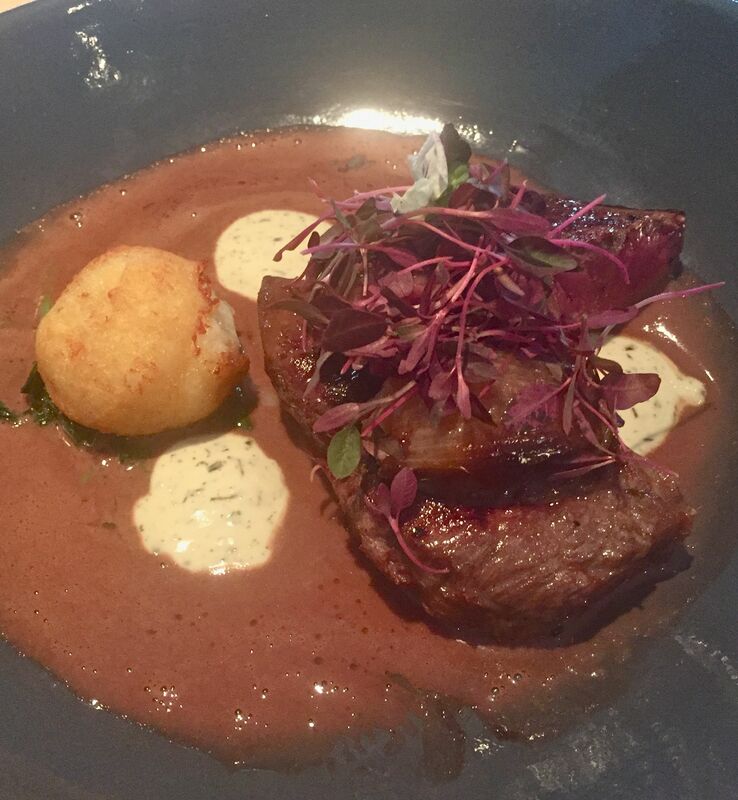 The steak dish also had some European touches served with a raclette and potato croquette (cheesy! ), a shallot and syrah sauce, tarragon cream drops and wilted baby spinach. The steak was perfectly done and bursting with flavour – I’d highly recommend you go for the sirloin rather than the fillet. Portions are generous at The Food Barn but you still really do have to order a portion of vegetables which they say serves two, but it’s big enough for four with your meals. 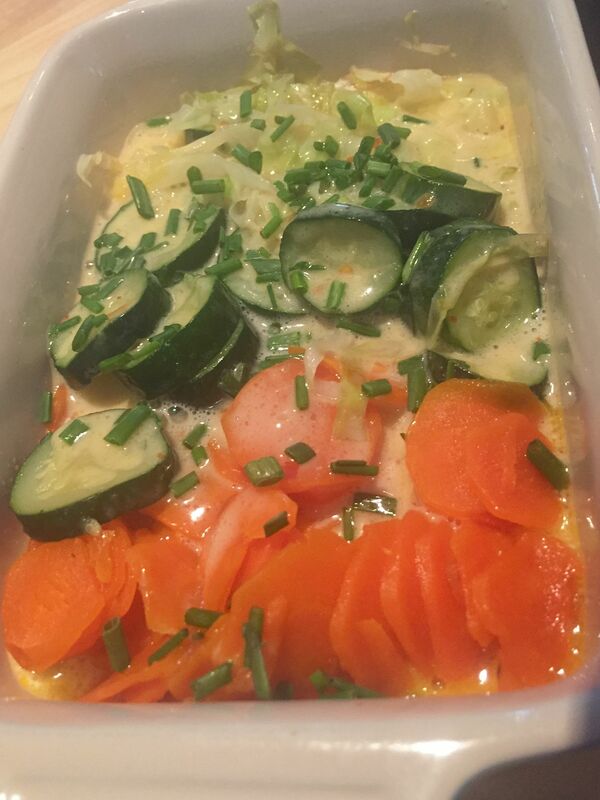 The yummiest combo of carrots, courgettes and cabbage with a light, creamy sauce and plenty of herbs. You won’t regret ordering it. So now we were perfectly replete. But I’ve learnt a lesson about top-quality restaurants. Don’t ignore the desserts! We shared two between three of us and they were top-class. And light, too – we had no problem polishing them off. This one is called Squashed Hibiscus Marshmallow. Now how can you not order that? 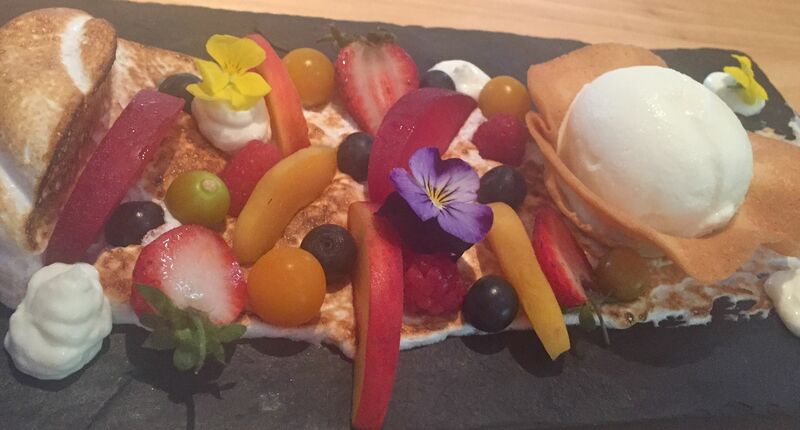 It’s served with stone fruits, spring berries, condensed milk sorbet and lime pannacotta. Who’d have though condensed milk sorbet could be such a revelation, very clever. 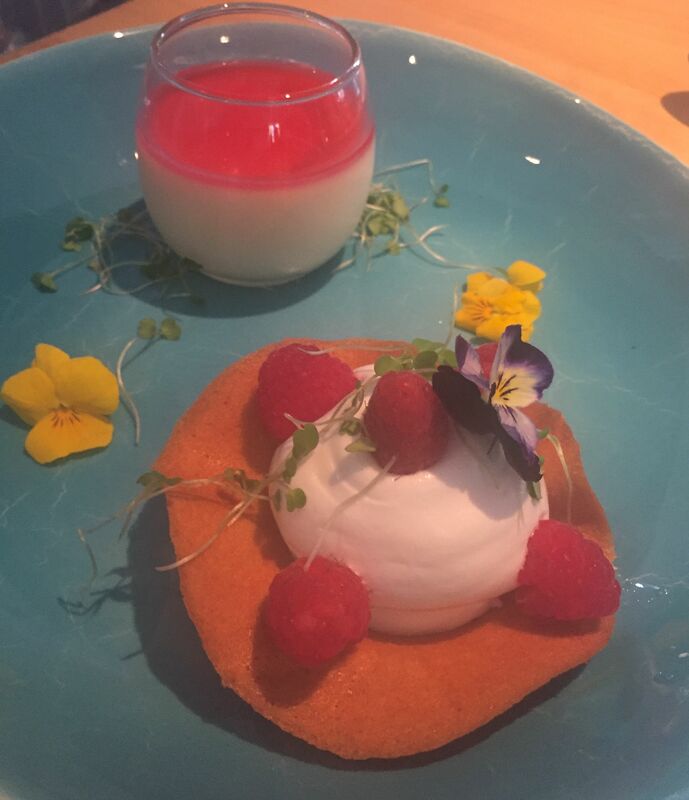 The lime posset was served with raspberry consome, soft meringue and a raspberry tuille. Again, light, fresh tasting and beautifully constructed. Okay, I’ve gone pretty big on my praise here, all I’m saying is it’s well justified. This lovely food is combined with great, friendly service – we asked our waitress Nicola for a bit of a break between starters and main and she organised it with a smile. There’s also a comprehensive wine list with some unusual choices that we hadn’t heard of before and it’s not going to break the bank. Hate it when restaurants overload the prices on their wine – which they often do. 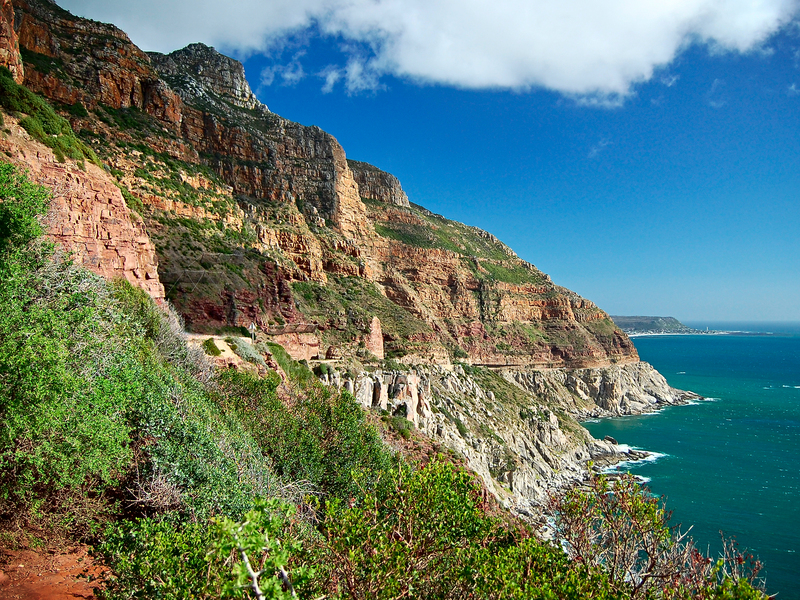 Oh and if you’re lucky enough to be coming from the centre of Cape Town make sure to take a leisurely drive over Chapman’s Peak to get there. This amazing pass is built on top of a layer of granite, cut into the softer rocks above. It’s hard to find imagine a drive that’s more stunning. The Food Barn is at Noordhoek Farm Village, Corner Village Lane and Noordhoek Main Road, Noordhoek.